SearchMyFiles utility provide a special search mode that allows you to easily find duplicate files in your system. When you switch to the 'Duplicates Search' mode, SearchMyFiles scans the files according to your preferences, like it does in the regular mode, but instead of displaying the list of all files, it only displays the files with identical content (duplicate files). In order to start using the duplicates search, simply set the Search Mode combo-box in the search options window to 'Duplicates Search'. It's also highly recommended to narrow the search by setting time, size or subfolder depth restrictions, because if don't set additional restrictions, the duplicate search might be very slow. Each chunk of duplicates files are painted with different color (There are up to 64 different colors) and there is also a 'Duplicate Number' column, which allows you to easily sort the list according to the duplicates order. SearchMyFiles is not just another duplicate files finder. It allows you to search duplicate files only with specific criteria, instead of scanning your entire hard-drive, so the duplicate files scan will be relatively fast. 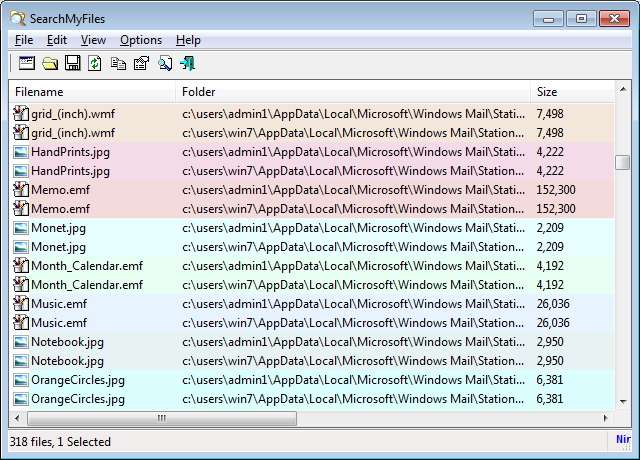 Find all duplicate files with .avi extension that their size is larger than 5000 KB. Find all duplicate files under c:\my files folder that were created on years 2005 - 2007. Find only the duplicate files that their size is smaller than 1000 bytes. Find only the duplicate files with 'hidden' attribute. Find all duplicate files that were created in the last 30 days.